Hanging baskets cheer up your home with colour and pretty blooms while adding dimension to your garden. Creating beautiful hanging baskets is easy when you know how, so we’ve created this ultimate guide to help you along. Before gathering everything you need, try to have an idea in mind of the finished look you’re going for. There’s plenty of choice when selecting the basket itself and the plants to go in it, so you might want to choose a colour scheme and style before going shopping. Pinterest.com is a great site for inspiration, just search “hanging baskets”. For example, you might decide to just have rich green foliage tumbling down for length, or you might prefer a big voluminous ball of colour with fuchsia and geraniums. The most popular type of hanging basket in Ireland is a wire basket, but there are also solid-sided plastic and wicker baskets, all available in a variety of sizes. Choosing a type is a matter of visual preference, although woven wicker baskets will be less durable in Irish weather. Size wise, bigger means less maintenance. If a basket is small in proportion to the plants, it will need more watering and pruning. Go for a larger size where possible, about 14-16 inches; it will retain water better, provide more rooting space and nutrient-rich compost, and allow your plants the room to grow and bloom fully. The lining for your basket is the more important choice as it plays an important role in creating the optimal environment for your plants. The right liner will provide the perfect balance between drainage and water retention. The most common and affordable is the cocoa liner, which is a thick, pre-moulded liner made from natural fibres. It holds water well with good drainage and aeration. Sphagnum moss is an alternative that works and looks well, but is difficult to work with. Burlap is another low price and environmentally friendly liner choice, but it does not retain water. And finally, Supamoss, which is probably the most versatile liner. It holds water with sufficient drainage, it’s flexible and looks natural. If you’re using a wicker basket that comes with its own plastic liner, you may need to punch some holes in the plastic to allow for drainage. The next ingredient for your perfect hanging basket is compost. The ideal compost to use is a peat-free, multi-purpose compost, to which you can add controlled-release food granules and water retention gel for best results. Common practice is to plant your hanging baskets in early spring in a greenhouse, and to put them outside once the risk of frost has passed, however there is no reason why you can’t plant winter plants in your hanging baskets to give your home and garden a lift through the duller months. Just remember not to water your hanging baskets as much in autumn and winter. You can then swap out plants as the seasons change and it refreshes your home’s exterior each time. Spring: pansies, dwarf bulbs (daffodils, tulips, narcissus), lobelia. Summer: fuchsia, yucca, geranium, petunia. Autumn: viola ochre, cineraria silver dust, mini cyclamen. Winter: solanum plants, winter pansies, dwarf conifers, heather, ivy, primula. Move the chains out of the way and stand the basket in a pot to keep it steady. Insert the liner into the basket, making sure the drainage is unobstructed. Mix the controlled-release food granules and water retention gel into the peat-free, multi-purpose compost and press it firmly into the bottom of the basket to a depth of 1 inch. Above the compost level, make three small cuts through the liner at the sides of the basket, each less than an inch in size. This will allow you to grow plants out from the sides for maximum visual effect. Wrap the plants you want to grow from the sides in paper and gently push them through the holes from the inside of the basket, so the root is still in the compost on the inside of the liner. Unwrap and remove the paper. 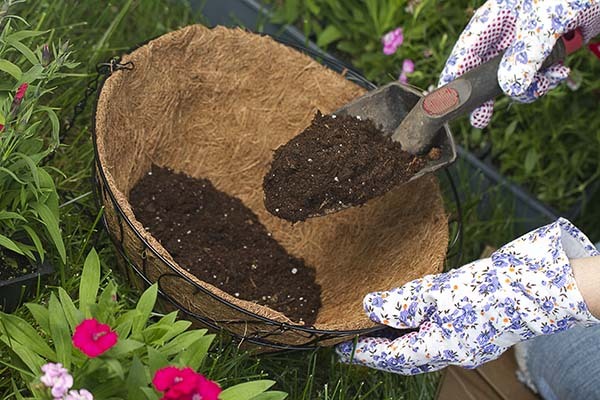 Add and firm compost around the roots of your side plants and then fill the basket with more compost to about two-thirds capacity. You can now add the rest of your plants and then fill with compost to near the top of the basket. You may now need to refer to our guide on How to Hang a Hanging Basket. Hanging baskets dry out quickly - they’re literally hanging out to dry! You will need to check them every day during fine weather, and you will most likely need to water them every day in summer. The compost should be kept nicely moist at all times. If the top of the soil is dry to touch, the basket needs to be watered. Water until you can see water coming out of the bottom of the basket. Try and position your hanging baskets where they can soak up maximum sunlight, which is essential for most flowering plants. Add a suitable liquid plant feed to baskets on a weekly basis. Deadhead to encourage new growth and keep baskets looking beautiful.